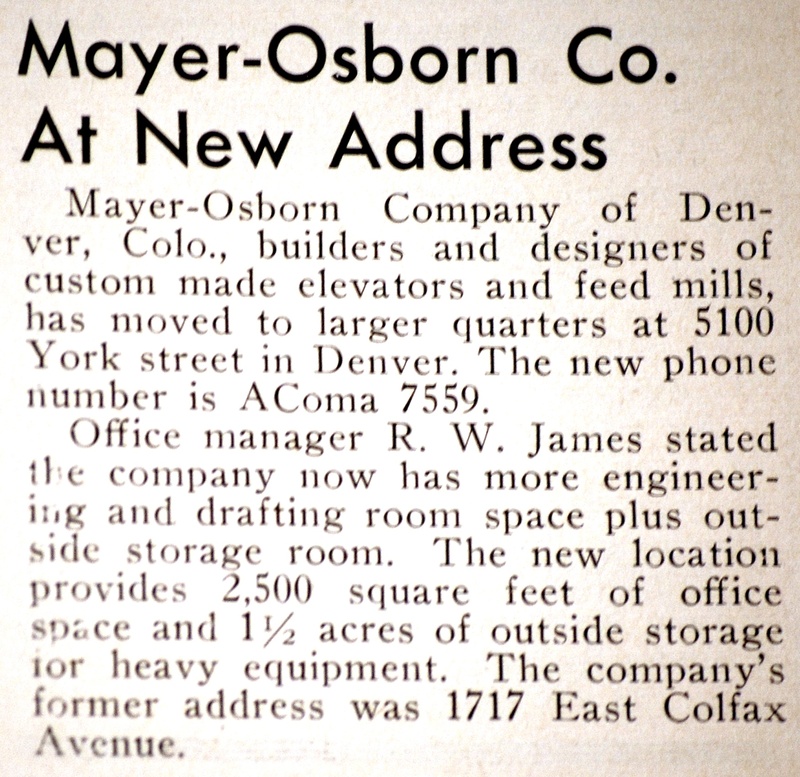 Mayer-Osborn was a Denver construction firm specializing in grain elevators. The 1717 E. Colfax Ave., Denver, Colo. location is for lease. 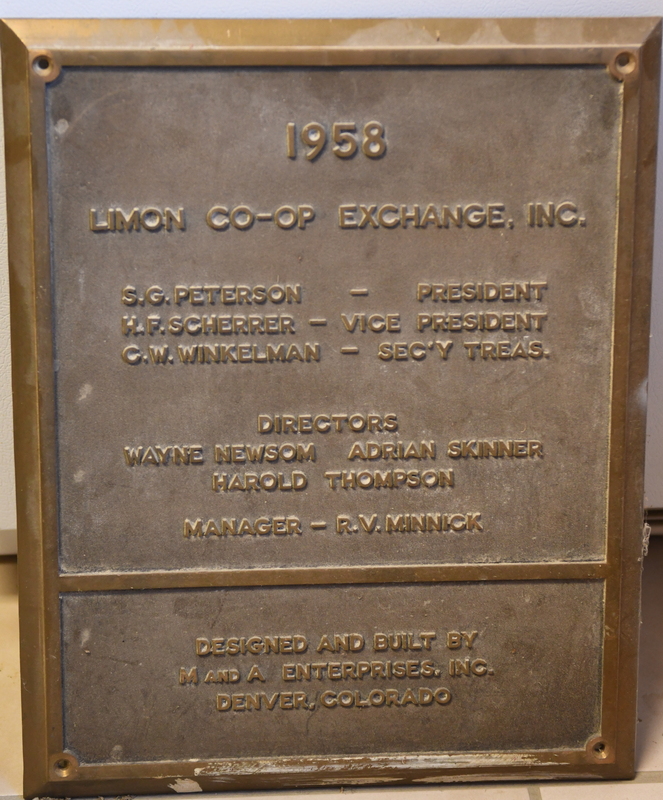 While enjoying our leisurely October road trip, my dad, Jerry Osborn, and I sought out the former business office of the Mayer-Osborn Construction Company, the Denver-based business my grandfather, William Osborn, operated in partnership with Eugene Mayer. It still stands at 1717 E. Colfax Ave.
Mayer ran the business office, while Grandpa was in the field selling their services. 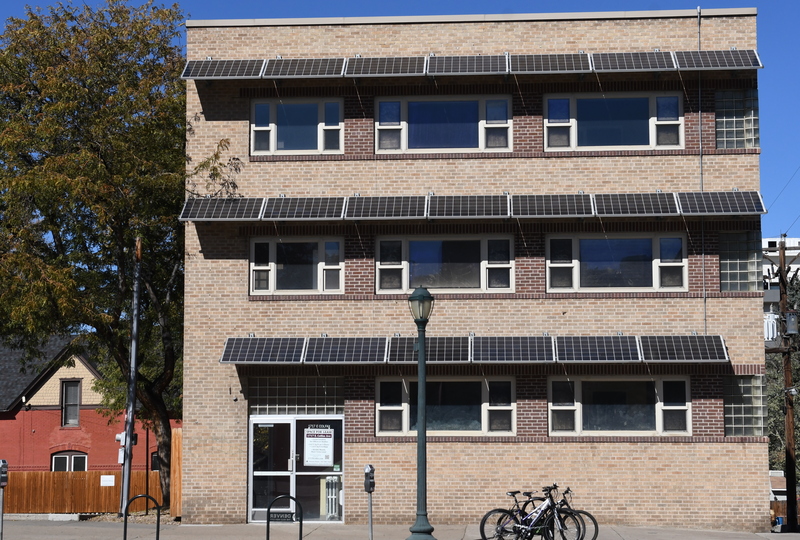 Their former office has undergone a smart update, now sporting solar panels and new brick siding, which has added great street-front appeal for potential tenants. The place was vacant, but it was settled into an optimistic, mixed neighborhood not far from the Denver Botanical Gardens. About four blocks from Denver’s Five Points, the area seemed to be on an economic rebound, though most buildings were older and fairly nondescript. Dad and I pulled across a busy grocery store parking lot to get a good vantage point. The photo above shows modern updates, including passive solar panels installed to take advantage of Denver’s many days of sunshine. Dad and I checked off another important historical visit, and went on our way, happy to see Bill Osborn’s Denver digs at last. 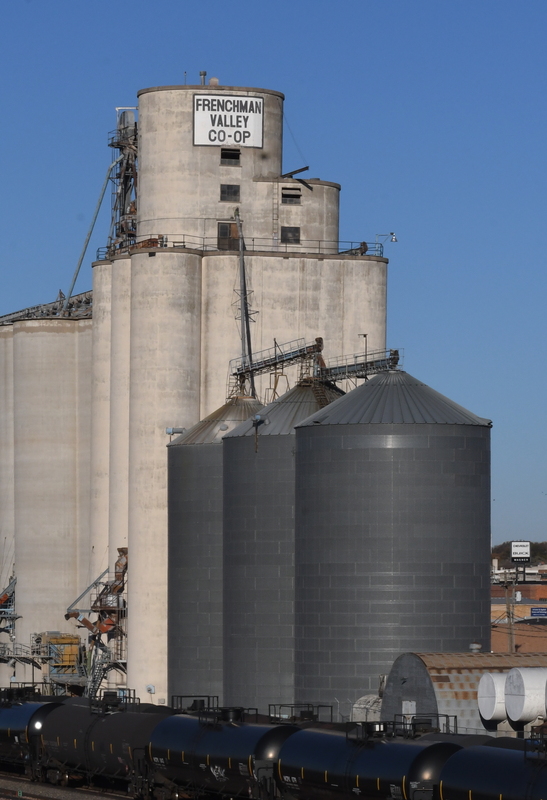 Update on redevelopment of the Mayer-Osborn elevator in Tempe, Ariz.
We have discovered news in the Arizona Republic about progress at the derelict Hayden Mill and Mayer-Osborn grain elevator site in Tempe. As the Republic’s story reveals, a developer plans to refresh the buildings and make a multipurpose facility that will entail converting the elevator into a hotel. We visited Tempe in 2012 and posted this story and photos. 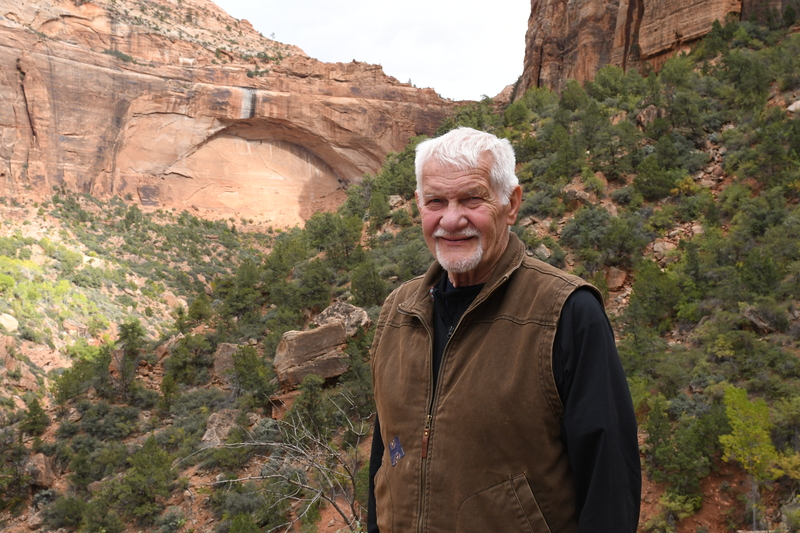 And we spoke a few months ago to John Southard, historic preservation officer for the city of Tempe, discussing some details of the project. This is a beautiful, sleek elevator that integrates the headhouse into the main house in a singular manner and represents Mayer-Osborn at the top of their game. 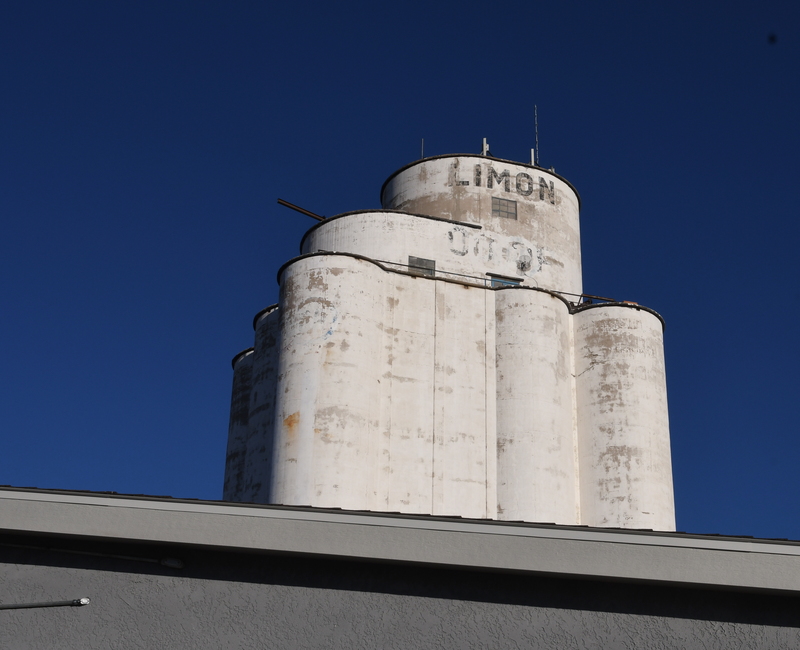 We plan to return to Tempe in a few weeks to get the low-down, and of course we will report further right here at Our Grandfathers’ Grain Elevators. Tillotson headhouse and ladder-climb challenge. Who wants to read an long rambling story about my travels through the Texas Panhandle and western Oklahoma when the weekend is coming and, before leaving work, you’d rather look at waders on the Cabela’s site? How about we look at a few more pictures from Follett, Tex., instead? 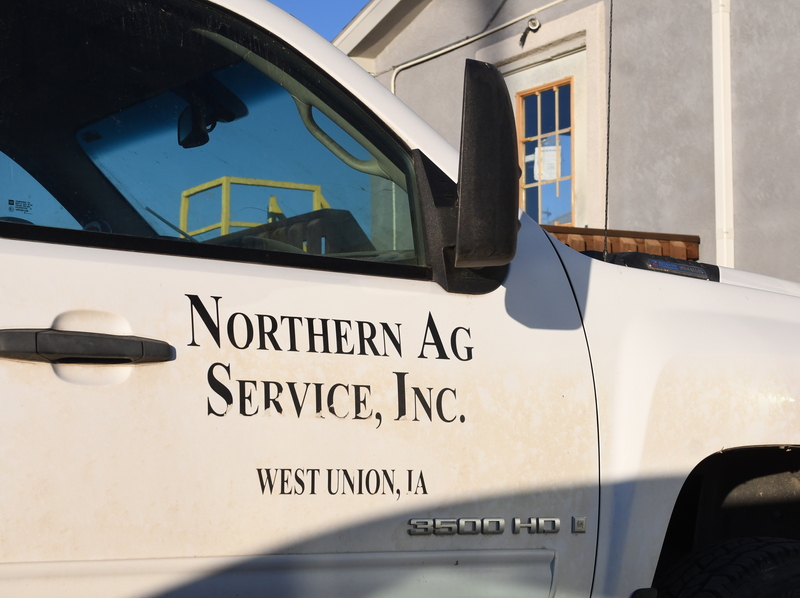 We have the unique circumstance of a Tillotson elevator and a Mayer-Osborn elevator at the same site. The Tillotson stands on the south end and the Mayer-Osborn on the north. The Tillotson has center and outside driveways and a gigantic 52-foot-tall headhouse. 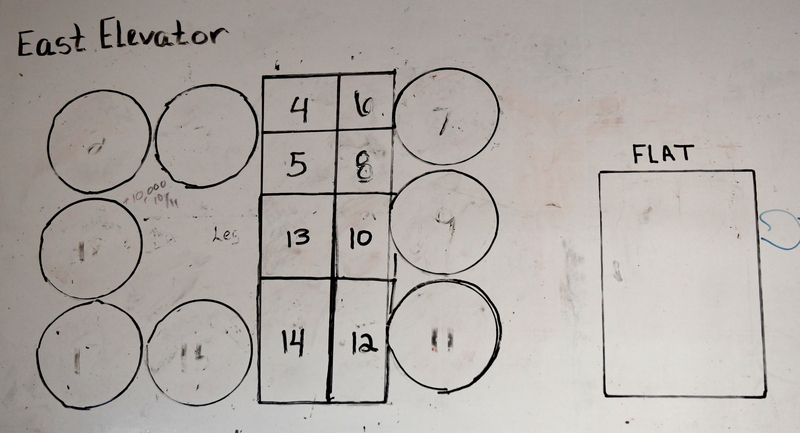 Even though it started with the standard Medford plan, it ended up a singular thing. The Mayer-Osborn has only an outside driveway, making the main house sleek as an eel, a showpiece with sheen. The east side smooths along like “On the Atchison, Topeka & the Santa Fe”–Johnny Mercer’s huge hit of 1945 (when neighbor Tillotson was built). OK, let’s roll the pictures. Mayer-Osborn has a boom, like many of the elevators I visited. As far as can be told, it’s a boom without a bust. Tillotson, left, with High Headhouse and central driveway, and Mayer-Osborn, right, with dual outside driveway and the sleek, smooth profile. Both main houses have storage-annex extension. Quite a nice cottage, as well, on the corner of Nagel St. and Travis or Frazier Ave. So long from Follett, Tex.! Looking for details of the Mayer-Osborn elevator in Follett, Tex. As I observed on Monday, we know a few locations where Mayer-Osborn built–for example, Roggen, Colo.; McCook and Maywood, Neb. ; Odebolt and Blencoe, Iowa; and Cordell, Okla. 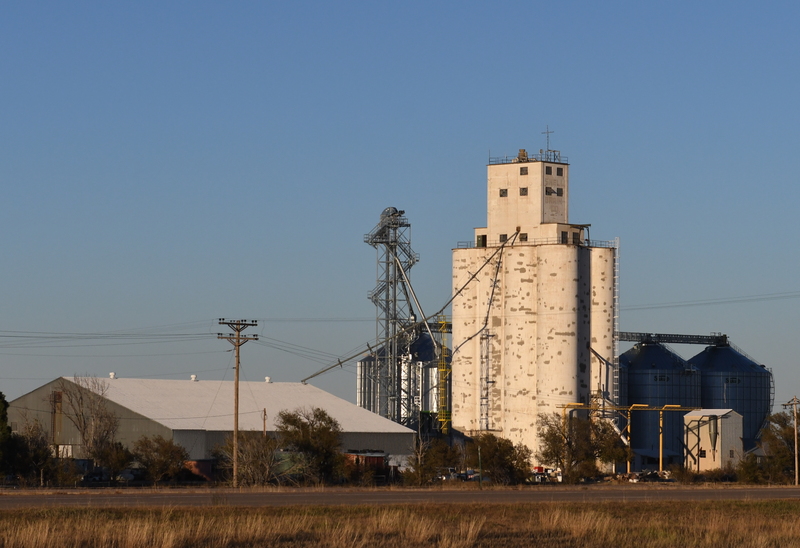 This Mayer-Osborn elevator in Follett, Texas, came as a surprise. It’s a handsome one, probably dating to the late-1940s, and in good condition. And it has a new owner. We would love to know his plans. Meanwhile, let me show you more photos of the mighty M-O elevator. One aspect you’ll note are the X-braced windows. My guess is it’s related to the routine, high winds. How Follett residents see their elevators. The 1945 Tillotson stands left, the Mayer-Osborn elevator on right. Without a central driveway, like the Tillotson, the M-O presents a sleeker, more streamlined profile. The headhouse has a step. This elevator was probably built in the late-1940s. In coming years M-O would enlarge the headhouse of their new elevators and curve the corners. The west side of the main house has a different shape from the east, which is smooth. The run from the headhouse and extending over the storage annex is unusually graceful. A few more details to share. Hover over each photo to make the caption appear. A Chalmers & Borton manhole cover in the storage annex. The northeast corner of the Texas Panhandle was the subject of dispute of between Texas and Oklahoma for 79 years, from 1850 to 1929, despite the precise boundary coordinates having been given as 100 degrees longitude and 36 degrees and 30 minutes latitude. A historical marker outside Follett says nine surveys were made to locate the Panhandle’s corner. None coincided. Nevertheless, land was annexed to Texas in 1903. One man claimed he went to bed in Oklahoma and woke in Texas. Finally, in 1929, the United States Supreme Court had a survey done, lines were moved, and that was that. The stepped headhouse would become a more exaggerated–and rounded–feature of Mayer-Osborn’s elevators. Whereas the officials had a hard time setting the boundary, the people on either side of it sure were good at growing grain, and it needed to be stored. We find in Follett the unusual, perhaps singular, circumstance of a Tillotson elevator and a Mayer-Osborn one on the same site. See yesterday’s post for an explanation. 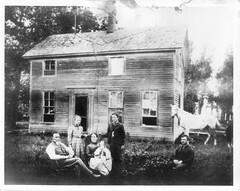 The M-O house and annex are seen at the top of this post and in pictures throughout. We know Tillotson’s was a 1945 job; without Mayer-Osborn’s records, I have to guess. Although this M-O has a stepped headhouse, which was their signature, it is composed of rectangles and has unique window arrangements, with three small daylight windows coyly stacked atop one another on the south face. (Again, this is seen in the topmost photo.) Like the Tillotson elevator, it is labeled “Farmers.” Both elevators have annexes by Chalmers & Borton. My guess is this was an early job for Mayer-Osborn. Close-up view of the Mayer-Osborn elevator. Mayer-Osborn’s outside double-driveway was unique. The door to the past was closed in Follett, Texas. The exterior walls of the Mayer-Osborn’s main house have an attractive flat surface over the silos. It looks aerodynamcally efficient, even if that’s not the point of a massive structure of reinforced concrete sticking up 150 feet on the windy Plains. The paint was excellent, almost glossy. Another feature was the outside double-driveway, something we hadn’t encountered before. I called the number given there and learned the elevators had recently been sold and was given a name and another number. But so far there’s been no response to my voice message.